Everyone on our team is an active musician, each with specialities and varying musical tastes. We thought it would be a good idea to share some of our favorites each week. You'll get to know us a little better and hopefully discover some new favorite songs to play! 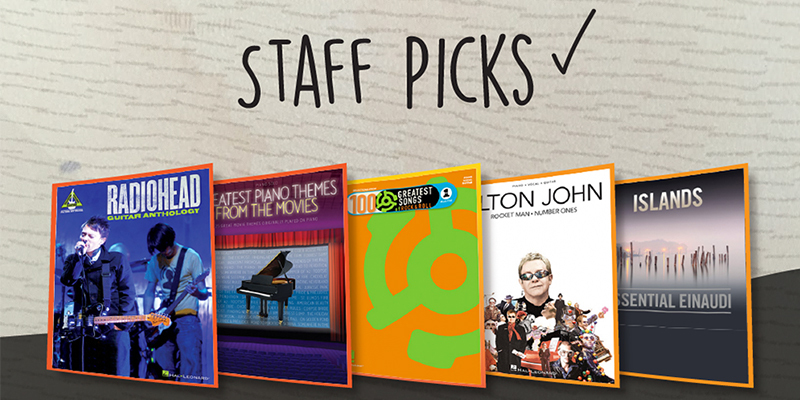 Enjoy the first edition of Sheet Music Direct Staff Picks. "This movie theme song from the film Arthur won the Oscar for Best Original Song in 1981. This is one of my favorite movie/tv theme songs to play on piano." "Not many traditional composers have managed to cross over into 'popular' music the way that Ludovico Einaudi has, and with his ability to produce the sort of simple but beautiful melodies you hear in 'Berlin Song', it's easy to see why." "Many consider this song to be one of the greatest keyboard rock songs of all time. Featuring Eddie Van Halen on keyboard, “Jump” is definitely one of my all-time favorites to play with my cover band, solely because of the great keyboard solo." "Towering builds, a punchy chorus and off-the-neck string bends make this 1995 Radiohead single a stone cold classic." "The intro is unmistakable and the switch between 3/4 and 4/4 time reinforces the idea that you're being taken to a magical place."